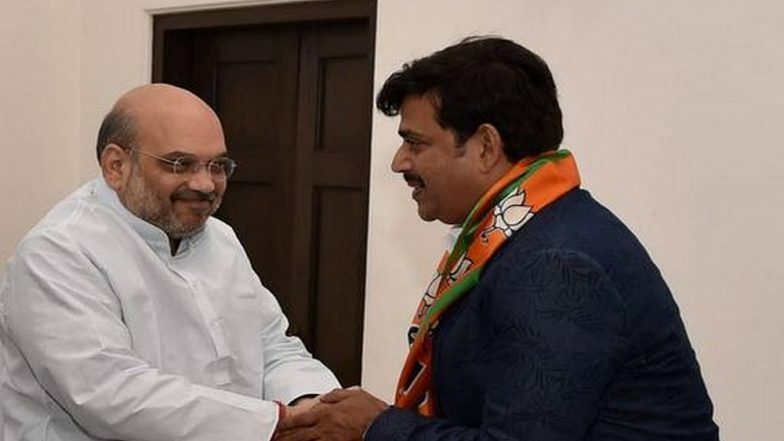 New Delhi, April 15: Noted Bhojpuri actor Ravi Kishan has featured in the Bharatiya Janata Party's (BJP) fresh list of candidates from 7 Lok Sabha seats of Uttar Pradesh. Kishan has been fielded from Gorakhpur instead of Praveen Nishad -- the "giant killer" who recently switched over to the BJP from the Mahagathbandhan. Nishad, who earned the tag of giant killer after wresting Gorakhpur - the bastion of Chief Minister Yogi Adityanath - in the 2018 bypolls, had jumped ship to the saffron camp after the SP-BSP combine refused to allot the Nishad Party more than 1 parliamentary constituency. Kishan, pollsters claim, is highly popular in Purvanchal or the region of eastern Uttar Pradesh and bordering parts of Bihar. He is one of the tallest film personalities in the region, and may allow the BJP to draw votes cutting across caste lines. Notably, the Gorakhpur constituency has been represented for a record five consecutive times by Yogi. The priest-politician had relinquished the seat in 2017, after being elected as the Chief Minister of Uttar Pradesh.